150 years ago the practical work of geologists in the field was considerable different to modern standards (at least in Europe), there were differences in the equipment, but also differences in the circumstances of exploring and mapping the area of interest. These differences begins even how to reach a specific area, today with cars most regions are accessible, 100 years ago geologists used when possible the first established train connections, but most localities were only to approach with carriages or by walking. Because these voyages were expensive, geologist used to save time and money and after arrival in the designated study area stayed in the field for months during the entire summer. To map a larger area, most time early geologists established a base camp where heavy equipment was stored. From this base camp they started in the field, sometimes for days, sleeping in farms, cottages or under the sky. It was a very physical work, for example the Austrian geologist Marcus Vinzenz Lipold mapped in 1853 in only one day the area surrounding the Großglockner (3.797m), and starting from the village of Ferleiten (1.151m), reached the Erzherzog-Johann-Hütte (3.454m), and finally descended back to the village of Heiligenblut (1.188m) - a heigth difference of 2.700m and a linear distance of 28 kilometres. Every geologist of the Austrian Geological Survey carried during field exploration the standard equipment: maps and a plate to draw on with a tripod, two barometers, pocket-compass, a common telescope and a telescope with incorporated compass, psychrometer (a tool to determinate the humidity of air), thermometer and a camera obscura (an ancestor of modern digital cameras). To these tools we have to add hammers of various sizes and a portable drill. Fig.1. 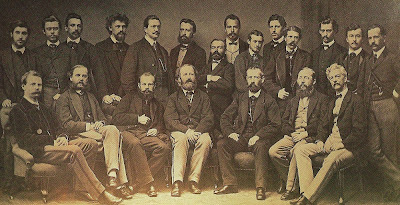 "Geognosts" around 1800 (unknown author, picture taken from AVANZINI & WACHTLER 1999). The equipment underscores the broad "uses" for geologists. Because natural science wasn't yet so specialized as today, and geology itself not so clearly delimited against other scientific fields, from a geologist it was also demanded that he possess know-how in meteorology, palaeontology, mineralogy, archaeology, botany and ethnology. 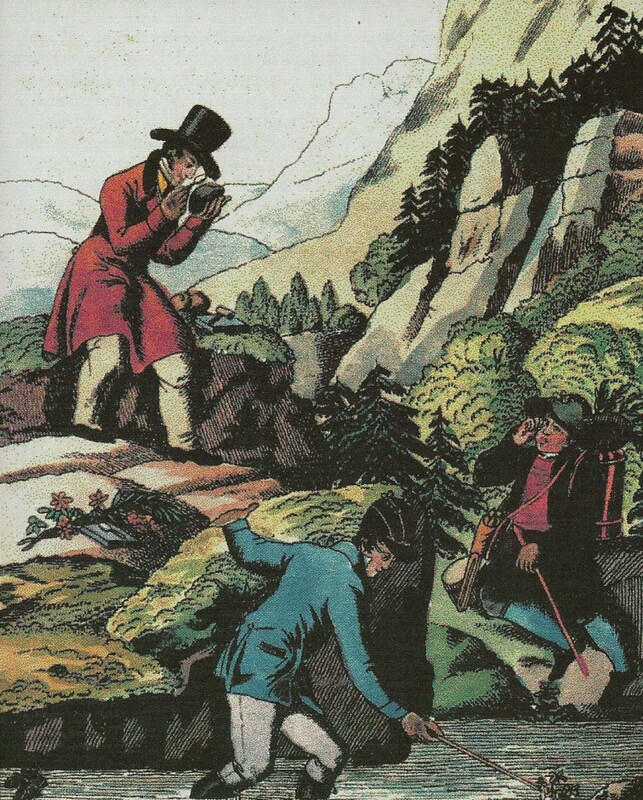 The geologist Johann Czjzek in 1850 describes the requests to be a geologist: "To every geologist mister Wilh. Haidinger, as head of the department, recommended these instructions; not only to carry out their geological tasks, but also to collect a broad variety of minerals, rocks, fossils and measurements, if these are related to science and regional and cultural studies, especially physical, geographical, historic, archaeological and ethnographic data, which connect the fossil world with the beginnings of our own history." Foreground: Ferdinand Freiherr von Andrian-Werburg, Karl von Hauer, Guido Stache, Franz von Hauer, Franz Foetterle, Dionys Stur, Adolf Patera. Background: Karl Griesbach, Melchian Neumayr, Edmund Mojsisovics von Mojsvar, Hans Höfer von Heimhalt, Rudolph Pfeiffer, Viktor Mazer, Heinrich Wolf, Joseph Hofmann, Franz Edler von Vivenot, Urban Schloenbach, Carl Maria Paul, Felix Franz Xaver Kreutz, Alois Pallausch.